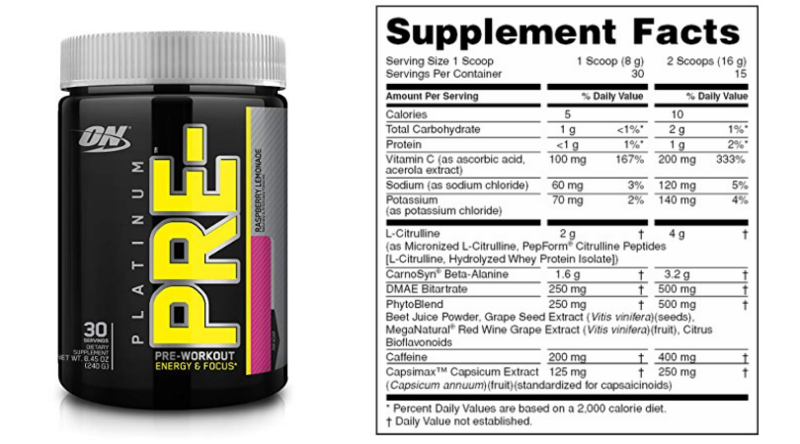 Many pre-workouts include creatine as one of their core ingredients. Creatine does have its benefits, but if you are one of those who only notices side effects or you just don’t like creatine, what options do you have? Well, we went out in search of the best pre-workouts without creatine. As mentioned before, creatine does have its benefits, but not everyone can or wants to take it. For some people, creatine will work great, for others, it can often cause an upset stomach. I don’t know about you, but for me, training on an upset stomach is definitely not optimal. This is just simply genetics, some people absorb creatine well and others don’t. If you are one of the unlucky few who struggles with creatine, then a creatine free pre-workout will be a much better option. This can also sometimes be overcome by switching creatine sources from say monohydrate to HCL. But, in the end, this will not be a solution for every single person. Do Creatine Free Pre-Workouts Do The Same Thing? 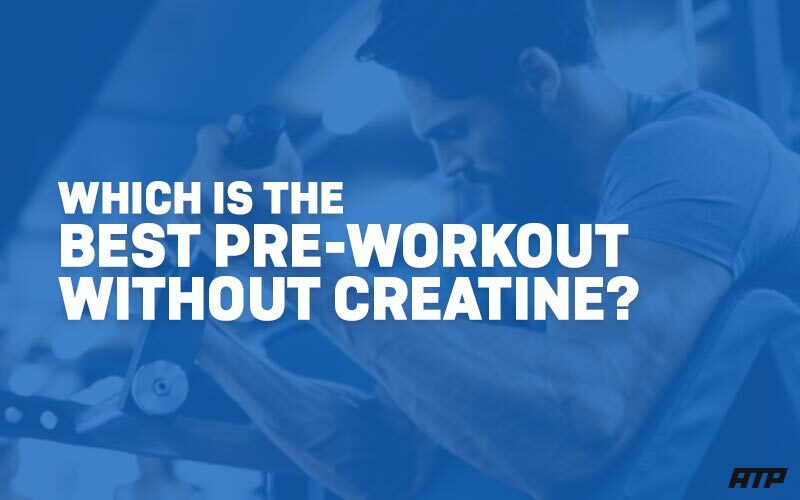 Creatine free pre-workout supplements still deliver great power while you’re in the gym. The best pre-workout without creatine will still contain ingredients that are proven to help increase energy, focus, muscle pump and endurance. What Other Ingredients Should You Look For In A Creatine-Free Pre-Workout? If creatine is out of the equation, what other ingredients should you look for? BCAAs (Branched Chain Amino Acids) refers to three amino acids: leucine, isoleucine, and valine. These 3 amino acids help prevent the break down of muscle and help to improve muscle endurance when taken pre-workout. BCAAs also help in preventing delayed onset muscle soreness (DOMS) which can help you get back to lifting faster. An optimal dose will be around 5g to 10g per serving, in a 2:1:1 ratio. Our top choice for a quality creatine free pre-workout is Animal Fury by Universal Nutrition. Universal Nutrition was founded in 1977, which means they are one of the oldest supplement companies on the market and have been producing a lot of top quality products. In each tub of Animal Fury, you will get 30 servings. Depending on your training frequency and how often you consume a pre-workout, one bottle can last 1-2 months. Mix one scoop in 12 oz. of water 30 min before the workout. Since the dose of caffeine is quite high, it’s recommended to start with only half a scoop and go from there. 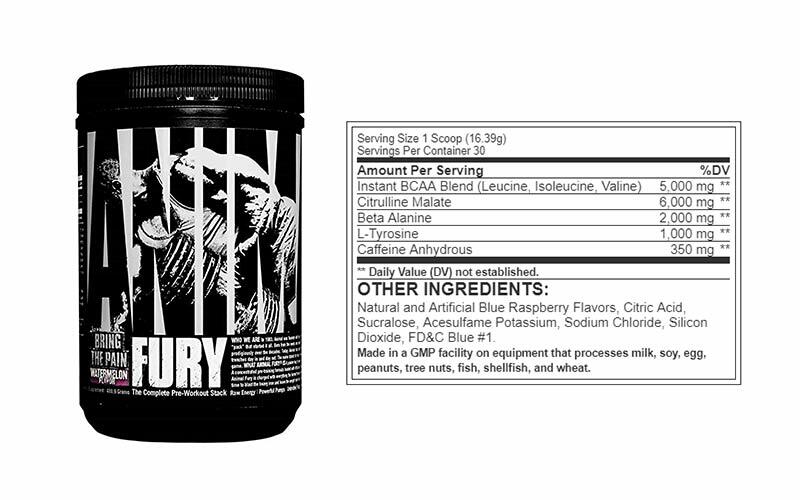 Animal Fury is one of the best creatine free pre-workouts on the market today, you will notice a definite increase in energy, performance, and pump. Overall you won’t be disappointed. Jacked Factory is a relatively new supplement brand, but they have a ton of positive reviews on Amazon.com. This could be due to their no proprietary blend formula and focusing on proven ingredients. 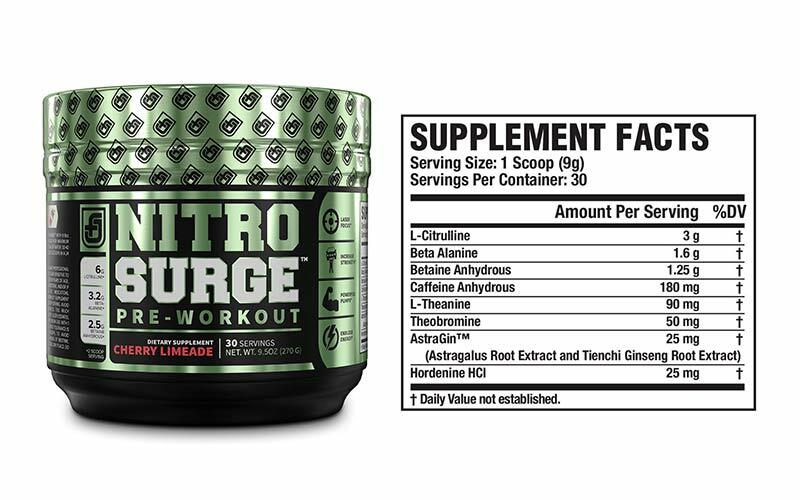 In each tub of NITROSURGE, you get 30 servings, which depending on how often you train should last between 1-2 months. Consume 1 serving (1 scoop) with 6-8oz of water 30-40 minutes before your workout. For maximum results, mix 2 servings (2 scoops) with 12-16oz of water 30-40 minutes before your workout. Although NITROSURGE doesn’t have an optimal dose of L-Citrulline, it does still provide a good pump, and with the other ingredients, you will still notice a boost of energy and an increase in muscle endurance. Optimum Nutrition is one of the most widely known supplement manufacturers. You may know them by their most popular product, Gold Standard Whey Protein. In terms of Platinum PRE-, Optimum Nutrition advertises it as a safe, high-quality, and clinically dosed pre-workout supplement. However, looking at the ingredient profile you will see that it is a bit underdosed in Citrulline. Does this make it a bad pre-workout? Not really, it still works well, it’s just not the best on our list, as Animal Fury would be a much better choice. This pre-workout would better be suited towards lifters who are new to taking pre-workout supplements. Mix each scoop with 6-10 oz of cold water (to desired sweetness) and consume immediately. Start with 1 scoop or less to assess your tolerance. It is recommended to not exceed two scoops per day, which is a good idea as it would be a lot of caffeine for the body to handle. Overall, it’s not a bad pre-workout and does provide the benefits it claims, however, I don’t like that it is a bit underdosed on the Citrulline. Most pre-workouts on the market do contain creatine, however, choosing one on our list would definitely help you boost your energy and pump, all without the creatine. Our top choice would be Animal Fury as it has the best doses of ingredients and overall tasted great.